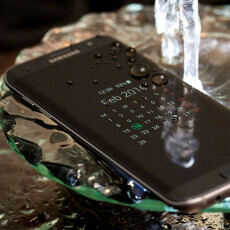 Both the Galaxy S7 and Galaxy S7 edge brought back water-resistance to the Galaxy S lineup. The feature was introduced with the Galaxy S5, but Samsung moved to premium design materials for its upscale Galaxy S6, eschewing the IP68 watertight certification in the process, only to restore it with the S7 tandem. If you have been secretly hoping that Samsung will continue the water-resistance trend with the much-awaited Note 6, your prayers might have just been answered, as a new report claims exactly that. The Note 6 will apparently sport the same IP68 waterproof certification that the S7 or S7 edge boast, and which recently allowed one of them to stay submerged in water for 16 hours and still keep on ticking. That is very welcome news for prospective Note 6 owners, but not the only new thing Samsung might have in store for the Note line this year. In the same report, the Note 6 is also rumored to house an iris scanner for unlocking the phone and other security shenanigans. In fact, 200 pieces of an "Iris Cam" have just been spotted as listed for Samsung Mobile testing purposes in an import database, as if to corroborate further the iris scanner possibility for a future Samsung handset that might just be the Note 6. If those rumors prove true, we might have a veritable monster on our hands by the end of July, when the Note 6 is speculated to be unveiled, what do you think? Instead of all these useless features Samsung better add dedicated camera button like Lumias have it. One button to rule it all. Now that's what I call an upgrade. And add in-the-box high-end earphones. Not all this useless crap. Blahblahblah. If apple adds it, than all shall follow and it will be a revolutionary innovation. Pardon. Sammy will independently invent it, of course. What a boring ball game. Btw its not hate but argumented critique, fanboy. I have a dedicated button on my Z2 and Z5, and it's a very convenient way to focus. It's a welcome feature if you ask me. Clars, welcome to the 21st century. Go see for example Sony Ericsson's 'quick launch' options from around 2005 on their k-series. One of best quick launch apps ever, yeah. And get to know Lumias. First press on, second press/hold taking photos/videos. Once Iphone adds dedicated camera button, it will suddenly appear on Samsung. Mark my words. A button exclusively for snapping pics sounds useless imo, when we already have buttons that u can designate to be it. What the point having dedicate button since Samsung can map the volume button as camera button for user that need a button to take photo. A dedicate button for camera usage only is pure nonsense and stupid. You can go and try to persuade samsung to ditch volume and onoff buttons. They are uselles. 10 taps for on, 15 taps for off. 20 for volume up, 21 for volume down. Stare at screen for 7 seconds - mute. 200? They're probably testing it then, wouldn't expect it to come to the note 6 considering it's also supposed to come with android N.
Note 6=The King. Move over, [b]itches! You can forever use Note4. Remember buy a a lot as stock keeping for your future usage in case your current one spoilt as Note4 will be your last phone ever can have. You might still can have new model phone if LG still keeping it the removable battery feature. Because of the removable battery?! You're buggin! Ikr. Was thinking of getting the note5 after the battery of my Z3 started to lose life. But when i thought of it, i might experience the same with it since it has sealed battery (that costs a fortune to have replaced you might as well buy a new phone). I got the note 4 instead with an extra battery. Very happy and i feel secured now.